How about a chance to win a cool prize and get recognition from across the simming community? Then do we have news for you! Ongoing Worlds is a website that brings together resources for Play by Post games across several genres. They are hosting their annual Flashback Week challenge from November 15th to November 22nd. SB118 was featured in last year’s competition when Fleet Captain Diego Herrera won the top prize and we’re hoping for another strong showing! 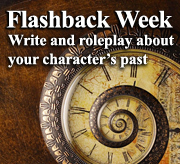 The challenge is simple: roleplay as normal, but add a flashback that shows part of your character’s backstory. Flashbacks are a great way to add depth and character development to your characters, as well as tell a story to your crew mates explaining more about who your character is. If you’re stumped for ideas or would like some hints on how to write the best flashback possible, Ongoing Worlds has a helpful tutorial on writing better flashbacks that you can use as a resource. Or check out their handy flashback prompts to get your ideas flowing. Entries must be written in English, and feature an existing player character. Entries can be no longer than 1500 words, and if you submit your flashback, you also allow Ongoing Worlds to publish your story on their blog. All of your writing should be original and your own creation. The winner receives an Ongoing Worlds mug and plenty of positive recognition from the simming community!